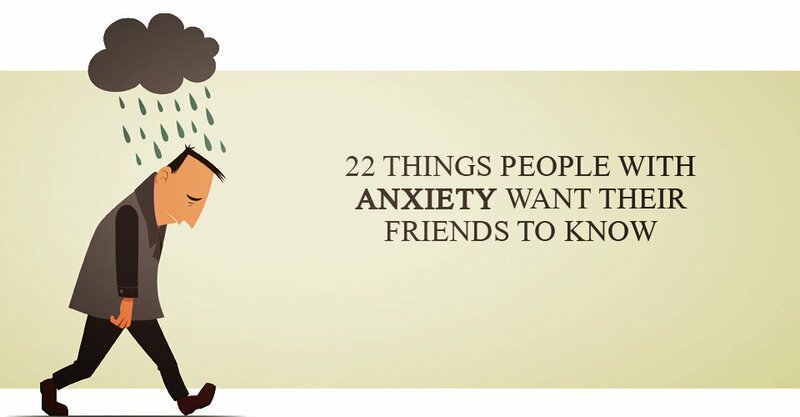 If you are friends with someone who has anxiety, chances are you’ve experienced some stressful, confusing, or just plain annoying situations in the relationship. UNANSWERED TEXT MESSAGES, AND REPEATEDLY DECLINED INVITES ARE TYPICAL OCCURRENCES IN THESE FRIENDSHIPS, BUT THERE’S SOMETHING YOU NEED TO KNOW. 1. Whatever is causing their anxiety might seem irrational to you, but it is very real to them. 2. Anxiety can happen at any moment, and when it does, they only need one thing: support. 3. They’re not blowing you off. It’s hard to make plans, and talking on the phone is equally difficult at times. It doesn’t mean they don’t desperately want to spend time with you and talk, they just can’t. 4. Be patient with them; anxiety doesn’t always look like a panic attack. Sometimes it comes out in the form of anger, or what looks like major frustration or annoyance. 5. Don’t take it personal if they do show frustration or anger- it’s not about you. 6. Even when things are wonderful, there is that anxiety and dread of something horrible right around the corner. Happiness is fleeting, at best. 7. When they are quiet, it’s not always because they are sad, bored or tired. Rather, there is so much going on in their mind that it is hard to keep up with everything going on around them. 8. Anxiety isn’t always explicable. Sometimes, even they don’t know why they are feeling anxious. 9. They’re sorry for all the declined invites, irrational behaviour, and hurtful things they said when they were feeling overwhelmed or scared. They’re sorry their anxiety hurts you too. 10. Even if they always seem to be isolated, don’t give up on them. They need to know you still care and want to see them. Keep inviting them- it means a lot that you ask. 11. Anxiety makes them examine everything, all the time. It can be exhausting. 12. They don’t want you to try and “fix” their anxiety issues. Instead, love them in all of their “as-is” splendor. After all, it is our imperfections that make us beautiful. 13. Anxiety isn’t always obvious. There are times you won’t even know they are experiencing anxiety unless they tell you. 14. If they are uncomfortable doing something, drop it. Forcing the issue only makes their anxiety worse. Smile, and move on. 15. Social interaction is difficult for some people with anxiety. Don’t assume that their repeated cancellations on your plans is in any way related to them being unfriendly or lazy. When you really need them, they will be there for you. 17. Keep inviting them to go out and do things with you. Anxiety wavers from day to day, and some days are brighter than others. There may come a time when their answer surprises you. 18. When they tell you they have reached their limit and they can’t take any more, they really mean it. Respect that and give them space to breathe. 19. When they tell you they can’t do something, they are the ones who feel the most disappointment. 20. Sometimes they just need to be alone. Anxiety isn’t able to be shaken off by “doing something fun,” and it can’t be remedied by using the same methods you would for someone who was recently fired, or dumped. They’re not mad or upset, they just need to recenter and relax. 21. When they talk to you, they will over-examine every word- the context, the grammar, the insinuations. And they might carry on obsessing over those conversations for years to come. 22. They are not their anxiety. They are a unique individual who only wants what we all want…to be loved unconditionally.